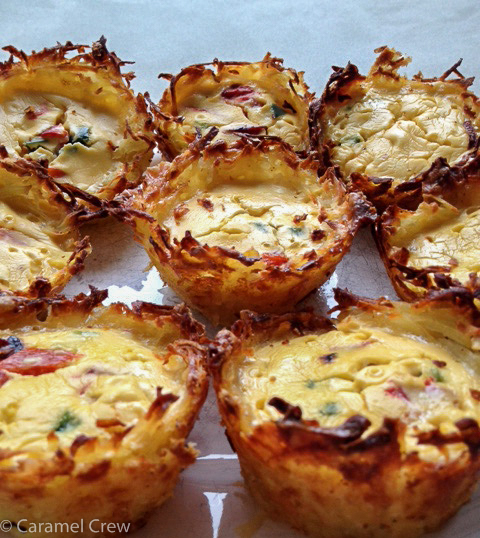 If you ever feel like doing something different and fun for breakfast or brunch, Jalapeno Hash Brown Cups are exactly that. 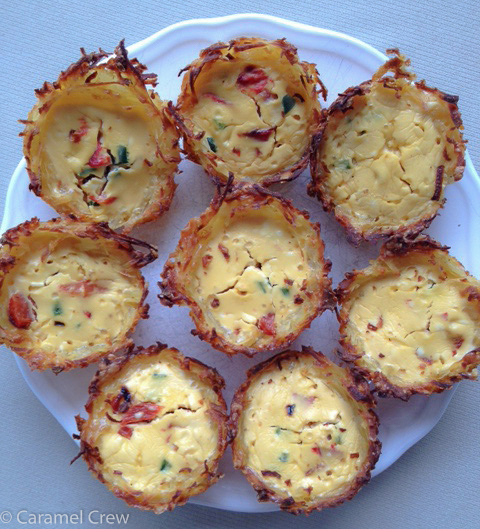 These pretty little nests are easy to customize and vary the filling as you like – some folks like to crack an egg into each cup, I wanted more variation to the flavors, as the hash brown cups are pretty mild in taste on their own. Basically you bake the cups first, then make the delicioso filling of your choice and pop them in the oven to cook. I used a cream cheese and egg base for the filling, velvety soft and perfect for the more spicy jalapenos and roasted red peppers. The amount of jalapenos to use depends on their hotness – mine were quite mild so I chopped up two. Feel free to use your favorite veggies (and fried bacon if you want a meatier version! ), I am doing an asparagus version next. You can use roasted peppers straight from the jar, if you like, but it’s very easy and fast to make your own: set the oven to broiler to 450° F. Cut a pepper in half lengthwise, cut out membranes, place the halves cut side down on a baking sheet lined with parchment paper and bake until the tops are covered in black spots, for about 10-15 minutes. Then wrap them up tightly in tinfoil and let rest for 10 minutes. Open the tinfoil pocket, slide the skins off the halves and chop them up. Once you have done this, you will never go back to the jarred stuff. Fresh is always better! 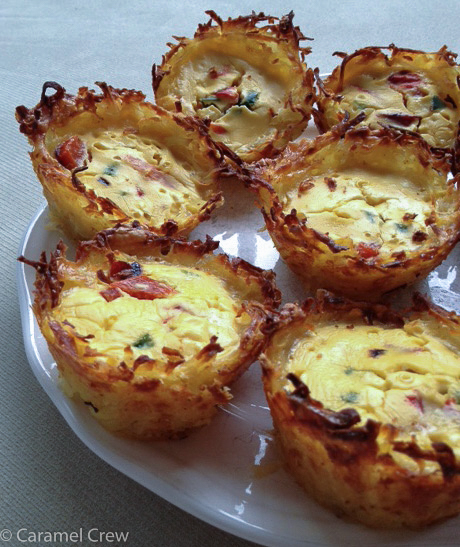 These breakfast cups are beautiful to look at, and make a great addition to any brunch buffet. They crisp up on the top nicely, giving that lovely crunch to balance the soft filling. The drier you squeeze the potatoes, the crispier the cups will be, so be sure to give them a hard twist to get the water out. I highly recommend using paper muffin cups inserted into the tins, they make the cleanup process so much easier. If you prefer the look of “naked” nests, just take the paper cups off before serving the cups. The cups are best enjoyed while still warm, fresh from the oven. 1. Preheat the oven to 425° F. Place paper cups inside the slots of a 12 slot muffin tin. Grate peeled raw potatoes with the large hole side of your grater until you have 2 cups. Put the grated potatoes on a cotton kitchen towel, bring up the sides and twist all the excess water out. Put the potatoes in a bowl and season with salt and pepper. Put in the grated cheddar and combine. 2. Using your fingers, pat the potato mixture on the bottom and sides of each paper cup, molding a nest-like shape. Let a bit of the mixture poke out from the top as the potatoes will shrink a little during baking. Take care not to put too much mixture on the bottom to prevent too thick, soggy cups. Bake on a center rack for about 15 minutes or until the top edges have browned but not burned. 3. Reduce the oven temperature to 350° F.
4. In a bowl, combine the cream cheese, salt, cayenne pepper, finely chopped red bell pepper, eggs and finely chopped jalapenos that have been deseeded and membranes removed. Mix until you have an even consistency. 5. Spoon the filling in the baked hash brown cups and bake for about 15 minutes or until the egg mixture is set and golden in color. Let cool in the tin for 10 minutes before serving.